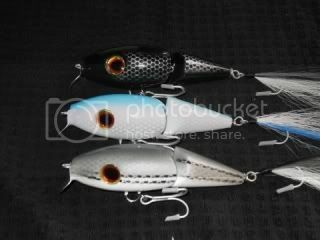 Which lures do you find most effective for stripers in the surf? Forget lures I only throw bait! since the fisherman magizine article i have run out of the jointed swimmers.if you would like to get on the waiting list email me the colors that you would like.they are $30 each . Black Label Plugs is a small Ocean County New Jersey Lure Manufacturer catering to surf fisherman who are looking to catch that once in a lifetime fish. Black Label Plugs specializes in handcrafted wooden swimming plugs predominately for large saltwater game fish. Being based out of New Jersey most Black Label Plugs are used to target larger Bluefish and Striped Bass. Please note that great detail goes into the construction of every Black Label Product. For instance all Black Label Plugs use heavy duty through wiring for connection of hardware components creating extra strong hook settings allowing you to really set the hook into those large fish. All Black Label Plugs are also thoroughly sealed so that you never have to worry about your plug becoming water logged and no longer swimming right. Black Label Plugs having been selling on Ebay for the past couple years with some excellent feedback. Thank you for visiting Black Label Plugs and Good Luck Fishing! If you would like to learn more about Black Label Plugs please click here. If you are interested in our products please click here. Watch our plugs in action in the media section. If you have any questions or wish to make a special purchase please feel free to contact us.